Age Limit: Candidates upper age should be 27 years as on 29-07-2016. Age relaxation is 03 years for OBC (NCL) & 05 years for SC candidates applicable as per Govt. of India Directives. Educational Qualification: Candidates should possess Diploma in Electrical Engineering for S.No-1, Diploma in Civil Engineering for S.No-2, Diploma in Electronics & Communication Engineering for S.No-3 from recognized Technical Board/ Institute, with minimum 70% marks. Application Fee: Candidates should pay Rs. 300/- through Online. SC, ST, Person with Disability, Ex-Servicemen and Internal candidates are exempted from payment of examination fee. 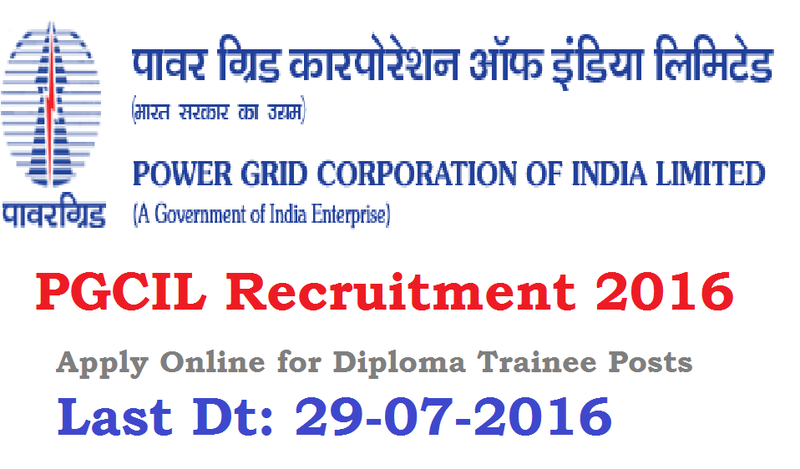 How to Apply: Eligible candidates may apply online through website www.powergridindia.com from 09-07-2016 by 10:00 Hrs to 29-07-2016 by 23:59 Hrs. 1. Candidates should log on to the Website www.powergridindia.com. 2. Go to “Careers –> Job Opportunities” Option. 5. Fill all the required fields carefully & submit the form. 6. Take printout of application & kept for future use. Starting Date for Apply Online : 09-07-2016 by 10:00 Hrs. 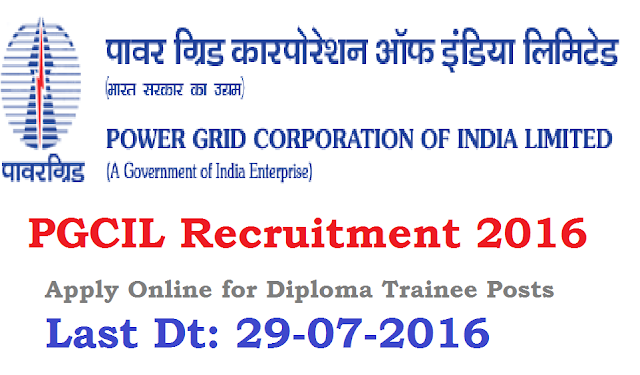 Last Date to Apply Online : 29-07-2016 by 23:59 Hrs. Last date of Remittance of application : 01-08-2016 (17:00 Hrs). Last date of Submission of Payment of Fee : 01-08-2016 (23:45 Hrs).